Passage of the bill comes just two weeks after it was first unveiled by House Ways and Means Chairman Kevin Brady. But that doesn't mean everyone in every income group would pay less. The TPC estimates that next year about 10% of middle income filers and 20% of the highest income households would pay more. Those percentages rise to 30% for each group by 2027. There is also a 6% surtax or "bubble rate" that applies to adjusted gross income over $1 million ($1.2 million for couples) until it effectively claws back the benefits of the 12% bracket for the highest income households. Doubles the standard deduction: The bill raises today's standard deduction for singles to $12,200 from $6,350 currently; and it raises it for married couples filing jointly to $24,400 from $12,700. Creates a new $300 family tax credit: Taxpayers may claim a $300 non-refundable tax credit for themselves as well as any nonchild dependent -- for instance, a son or daughter over 17 whom you're supporting, an ailing elderly mother or an adult child with a disability. So a family of four -- two parents, a 12-year-old daughter and an 18-year-old son -- could reduce their tax bill by up to $2,500, said Elaine Maag, a senior research associate at the Urban Institute. They could claim the $1,600 child tax credit for the daughter, the $300 nonchild dependent credit for the son and a $300 credit for each parent. Many argue that this "worldwide" system puts American businesses at a disadvantage to foreign competitors. That's because those competitors come from countries with territorial tax systems, meaning they don't owe tax to their own governments on income they make offshore. Taxes existing overseas profits: The House bill would impose a one-time rate of 14% on existing foreign profits if they're being held offshore in cash. Foreign profits that are invested in noncash assets offshore would be taxed at 7%. Companies would have up to eight years to pay what they owe. 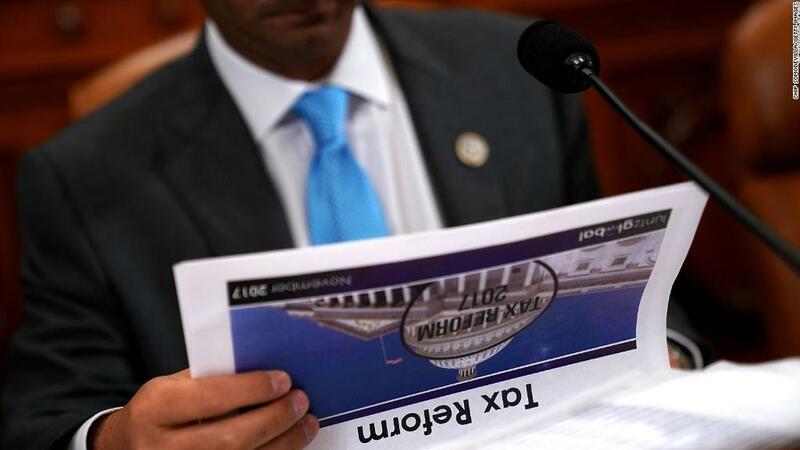 The measure would raise revenue from income that has so far escaped U.S. taxation. Under current law, companies pay U.S. tax only when they bring the money home. But it's also meant to entice companies to invest some of the foreign profits stateside. Lowers tax rate on pass-throughs: Most U.S. businesses, large and small, are set up as pass-through businesses, not corporations. They're called pass-throughs because their profits are passed through to the owners, shareholders and partners, who pay tax on them through their personal returns. The House bill would lower the top income tax rate on pass-throughs' profits to 25% from 39.6% today. It would also offer a phased in lower rate of 9% for businesses that earn less than $75,000. That's below the 12% bottom bracket in the House bill and below today's 10% bracket.